Welcome to the Ink It! Stamp It! Design Team Blog Hop - we hop every month so be sure to pop back and visit us again! Today our theme is to use our favourite Retiring Bundle from the 2017-2018 catalogue. 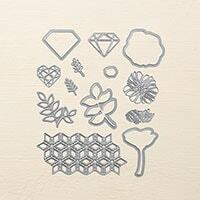 The Delightfully Detailed Laser Cut Paper is used in three different ways in this card! 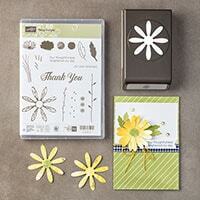 Whilst the Daisy Delight Bundle is retiring, the Daisy Delight stamp set and coordinating Daisy punch are continuing into the new Annual Catalogue. So now is a really good time to buy them (before 31st May) while you can still buy them as a bundle and save 10%. 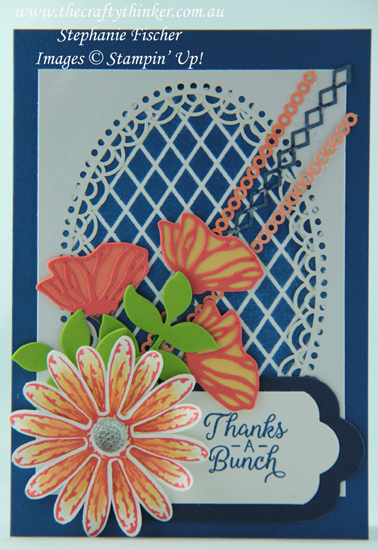 The blue and white lattice background was a by-product of a card I'll be sharing in the near future. While sponging the lattice frame, I placed a piece of Whisper White cardstock underneath - two birds, one stone! The Delightfully Detailed Laser Cut paper will be available from 1 June in the new 2018-2019 Annual Catalogue. 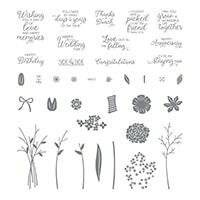 The greeting is from the Beautiful Bouquet stamp set. 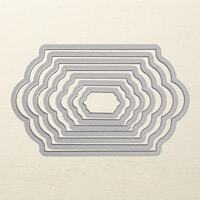 I hope you've enjoyed this this project and I welcome your comments. Thank you so much for joining us today. We hope you'll join us again next month when we'll be exploring the new 2018-2019 Annual Catalogue!